QDAC supplies high performance data acquisition solutions that use a common technology platform based on a modular and scalable architecture. This allows QDAC to quickly configure and customize a solution for specific applications, with relatively minimal engineering effort. 3. Sensor-Fused Data Acquisition products for integration into OEM sensor products. All product categories utilize the same core patented technology. 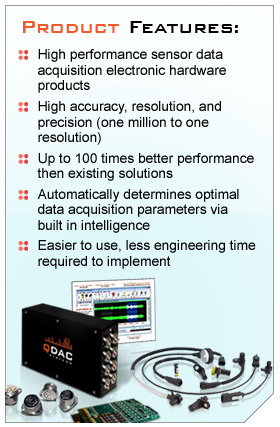 QDAC has developed three product classes to address the markets and applications of data acquisition systems. is typically required in other data acquisition solutions and significantly simplifies operation and use while still meeting specific requirements for a wide range of tests or applications. Ultimately, QDAC’s value proposition enables new applications, improves existing ones, and reduces costs.